It may be a little harder to keep house if it's built upside down. The first hands-on interactive attraction with an upside-down kitchen, garage, bedroom and even a bathroom has opened for public viewing in Russia. Entering the topsy-turvy house, visitors experience the novelty of walking on the ceiling. Familiar household items and items of furniture hang overhead, the ceiling is under your feet, while the entire house stands at an angle. Many say that walking inside an upside-down house is something akin to riding a roller coaster. 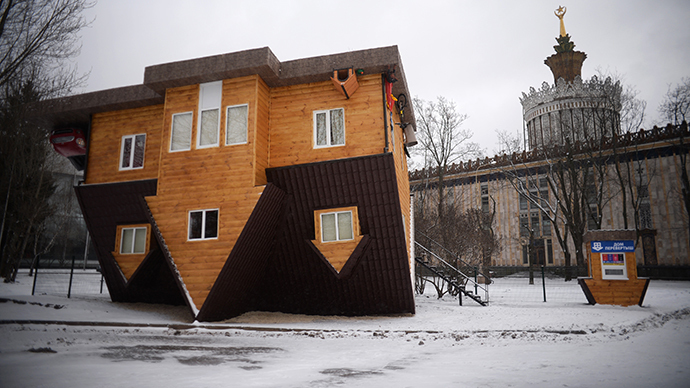 The architects behind the Moscow upside-down house project have studied international experiences, and created their own design using the most successful and popular solutions for similar interactive attractions. The interior of the house reproduces an average European suburban design, with a set of standard furniture, as well as a typical small car in the garage. The quirky house is on show at the All-Russian Exhibition Center in Moscow. A house that stands on its roof can also be found in the Polish village of Szymbark, at the foot of Mount Wiezyca, the highest mountain in the Kaszubian Province. Polish architects created another signature upside-down house in the small western Austrian village of Terfens. Upside-down houses can be seen around the world, with one in Kiev, a house in the seaside resort in Trassenheide in Germany, and one in the Japanese city of Matsumoto, just to name a few. There's also a series of White Houses in the US: in Orlando, Florida and Tennessee, as well as the so-called Top Secret, the biggest upside-down White House, in Wisconsin.